What Jamotec ham holder buy for professional purpose? What Jamotec ham holder buy for domestic use? What Jamotec ham holder to buy for a ham or shoulder ham? What material are made of the Jamotec ham holder? 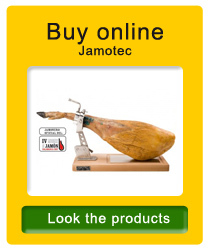 Jamotec company specializing exclusively in the manufacture of ham holders, was founded in 1994. He introduced to the market a new system that revolutionized the industry and made it to position itself among the top brands of manufacturing worldwide Ham holders, with the system 'rotating Caps', a mechanical precision system, providing great confidence and comfort for the ham cutter. To give you an idea of the expansion of the brand, Jamotec ham holders are distributed and are present in more than 40 countries. 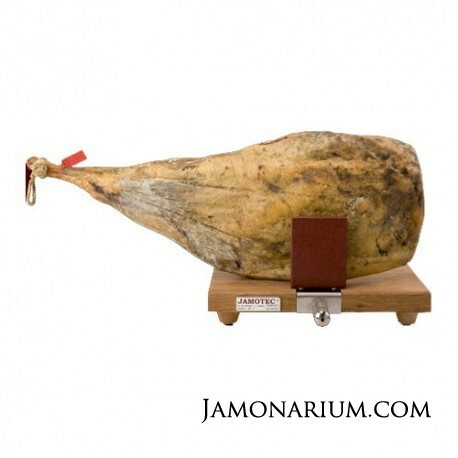 The entire range of Jamotec ham holders is characterized by its fine, robust and compact design. With its innovative "Rotary Caps", which consists of a bearing guided by lateral axes, maneuver the ham or shoulder ham for cutting and reposition itself is as easy as safe. It also offers an innovative and aesthetic design for cutting in public and as an exhibitor. It has a variety of models to suit every need, whether for cutting at home or professional use. Access to every corner of the ham without problem, using all parts and gaining profitability. Indispensable in any gastronomy establishment and butchers. 3. What Jamotec ham holder buy for professional purpose? The household rotary folding ham holder from Jamotec provides all the necessary conditions to cut hams and shoulders ham in two positions: classic and transversely, place the ham in a horizontal position. It has a rotating gripper system which facilitates handling. The base of this ham holder is wide to provide extra stability. Made of high impactpolystyrene (HIPS) and polyamide (PA), stainless steel and treated steel. The household rotary ham holder from Jamotec provides all the necessary conditions to cut hams and shoulders easily, this ham holder incorporates a rotating grip system which allows to adapt the ham holder to various positions making it realy easy to turn the Ham or Shoulder. The basis of this ham holder is wide to provide extra stability and it is comprised of polypropylene and polystyrene, a combination of plastic which makes it highly resistant and easy to clean. 4. What Jamotec ham holder buy for domestic use? 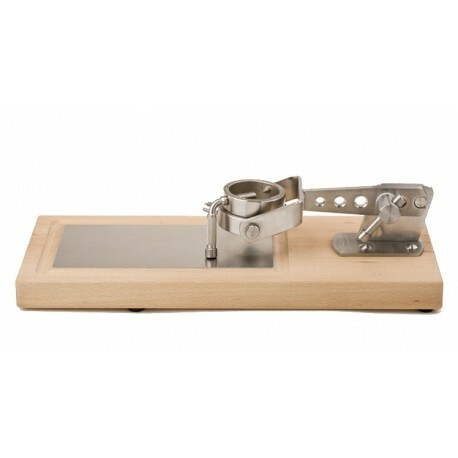 The wall ham holder with rotating subjection Jamotec (J1+) is an excellent ham holder made with solid stainless steel and beechwood base with non-slip surface. Its design allows us to place the ham / shoulder either horizontally or vertically (includes envelope with plate and screws to fix it to the wall). the rotating subjection system allows us to turn the ham / shoulder very easily. It is an excellent ham holder for professional or domestic use. The ham holder for dried meet and Boneless Hams Jamotec is a fantastic tool for cutting boneless hams or dried meet, this ham holder stands out for its versatility. 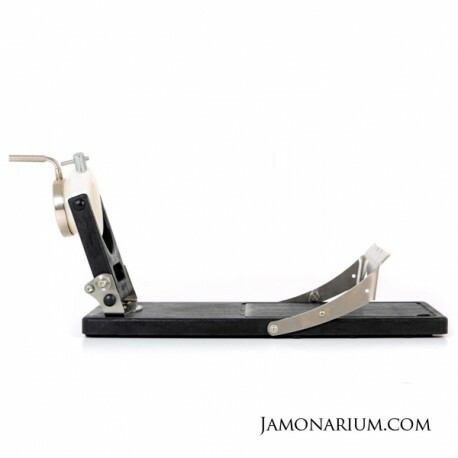 It got a firm teeth grip made of stainless steel, and its design is very attractive with a base of solid beech wood. 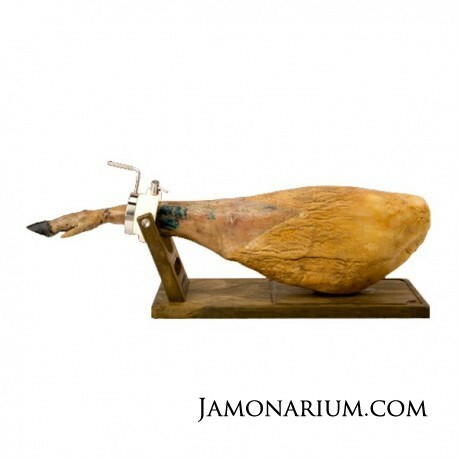 The Professional Ham Holder with Rotating Grip Jamotec is the ideal utensil for cutting hams and shoulders, this fantastic ham holder has a broad base of solid beech wood which provides great stability and strength. It also incorporates a rotating grip system which allows easy clamping in any position and makes it really easy to turn the hams and shoulders. The professional foldable Ham Holder with Rotating Grip from Jamotec is the ideal tool for professionals and ham enthusiasts. This ham holder has absolutely all the features expected of a professional ham holder, its base is wide and made of solid beech wood with non-slip surface to provide great stability and strength. This ham holder incorporates a rotating grip sistem which allows to adapt the ham holder to various positions making it realy easy to turn the Ham or Schoulder, plus its design allows to fold the metal body in order to transport it easily and safely (it comes with a ham holder bag). 5. What Jamotec ham holder to buy for a ham or shoulder ham? 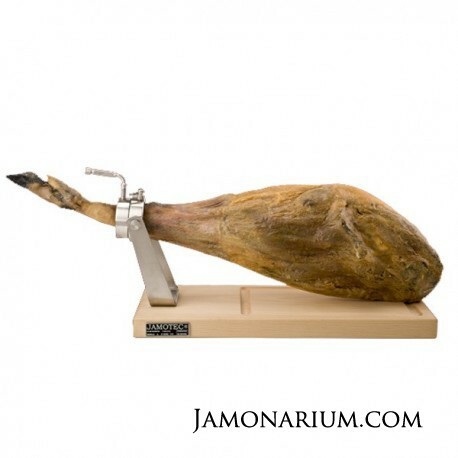 All Jamotec ham holders, thanks to its stability, can be used indifferently for ham or shoulder ham. However, if your use is limited exclusively to shoulder hams, we advise the home line, since these ham holders offer great stability, plus they are easy to clean, but the choice depends on your needs. 6. What material are made of the Jamotec ham holder? 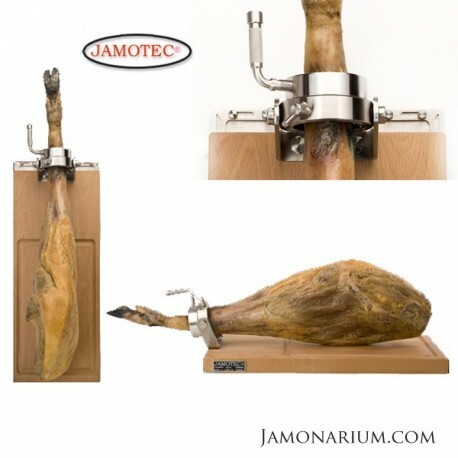 The Jamotec ham holder are made of different materials and resistant, depending on the model. The rotating arms are made of stainless steel. The main materials used to manufacture the home line are high impact polystyrene (HIPS) and polyamide (PA), stainless steel and treated steel. The professional line are, depending on the model, solid stainless steel and beech wood.